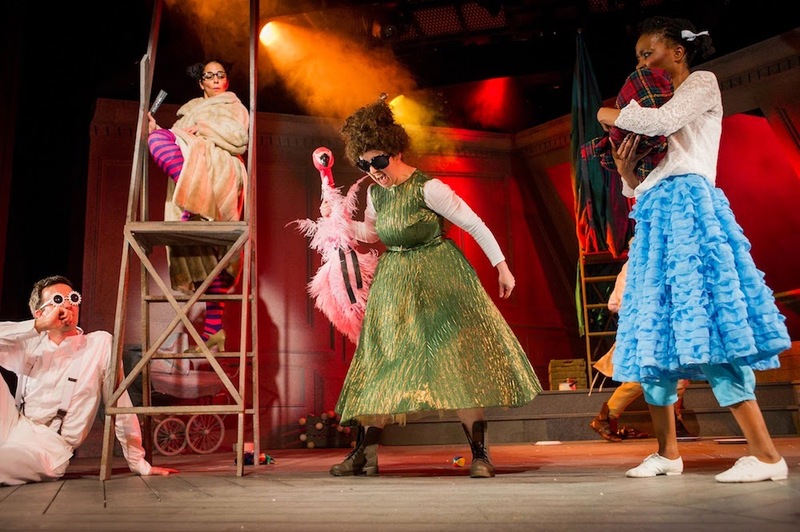 Last weekend I took Isla, my best friend Soula and her son Samuel along to the Polka Theatre in Wimbledon to check out their new production of Alice's Adventures in Wonderland. 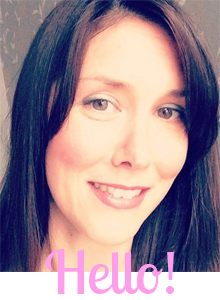 Soula is a busy mum like me but when I asked her if she'd write the review of the show, she obliged,as in another life she would have loved to write and with the little spare time she does have she wrote this wonderful piece for I Heart Motherhood! Over to you my lovely. 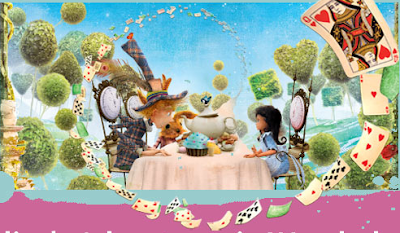 Having a best friend who runs a successful blog does have its occasional perks; so when she invited my son and I to go and see Alice in Wonderland with her at the Polka Theatre I thought I’d be a mad hatter to turn her down! I wasn’t even aware of the Polka Theatre (although later discussions revealed that I had indeed been there with my father as a child many years ago). The theatre is solely aimed at producing and presenting Children’s theatre and to my surprise has been there since 1979 (probably why I can’t remember going as a child)! Samuel and Isla were born 3 months apart and the two of them are good friends, and their excitement as we walked to the theatre was palpable. As we entered we gathered in the main foyer where the kids could play with the various toys scattered around, whilst we purchased some snacks for the performance - from a reasonably priced bar which even served a decent cappuccino! As we made our way to the main theatre we passed a lovely area filled to the brim with teddy bears, which the children can play with, and enjoyed the nostalgia generated by seeing the more collectible bears displayed in beautifully presented glass cabinets; remember Super-Ted and Fozzie Bear from the Muppets anyone? Well this is where they are enjoying their retirement! On to the show… Now I have to hold my hand up here and admit that I have never actually read the original book of Alice in Wonderland and have only seen the rose tinted Disney version – and even that was many years ago. This meant that as the show began, I was trying to remember what I could about the Disney adaptation – and it ended up being quite different to what was actually portrayed! The show opens with Alice and her sister stuck indoors on a cold snowy day. Alice is energetic, inquisitive and a total contrast to her older more restrained sister. They bicker and at this point I wasn’t really sure what happened as Alice calls her sister a ‘Pig’ and then suddenly she is falling into Wonderland. If there was a reference to the rabbit hole I must have blinked and missed it because I remain still unsure of how she actually entered Wonderland! Alice’s indecision about whether she should drink the potion labelled ‘drink me’ had the audience laughing, and the way she moved her body to represent shrinking and growing, was clever enough that my 4 year old understood what was being portrayed. The show goes on to accurately portray the chapters in the book (something I have learnt now having investigated the original story) and Alice progresses through her journey in Wonderland meeting varied and interesting characters along the way. The scene that introduces the duchess, her cook and the Cheshire cat is noisy and bewildering, with lots of shrieking and sneezing, and banging, amidst a smoky haze – and quite frankly is completely bizarre to those unfamiliar with the book. The fearsome Queen of hearts was played brilliantly and her frequent cries of ‘off with their head’ kept the audience amused before we observed the most entertaining game of croquet I’ve ever seen! As Alice’s journey through Wonderland comes to an end, and she herself almost becomes a victim of the queen’s ruthless rein, we breathe a sigh of relief when she is transported safely back to her home, just as she had left it – with head firmly attached to her body! I thought the small team involved in the production do an amazing job – not only portraying all the main characters between them, but also managing all of the props and stage rotations. The entire cast is played out by just 6 people, with some playing up to 5 characters each! The costume changes were so quick it was hard to believe the same person had just been playing something else. They were all great but of course I think it’s the Queen who steals the show. Samuel enjoyed it although I think a lot of it went over his head (to be fair he is only 4 and the production is aimed at children aged 6 and over so he was probably a bit too young really). That said, he and Isla were completely gripped throughout and both had a thoroughly good time. All in all I thought it was a clever production and well worth seeing. The Polka theatre in itself is a lovely venue and worth a visit even if you are not taking in a show – they even do children’s tea parties there which I imagine are a nice way to celebrate a birthday if you live in the local area. Thanks to Sharon for inviting Samuel & I to Alice in Wonderland and for introducing me to the Polka Theatre – I will be returning… and to make up for my ignorance I promise to also read the original Alice's Adventures in Wonderland by Charles Lutwidge Dodgson (more commonly known as Lewis Carroll)! 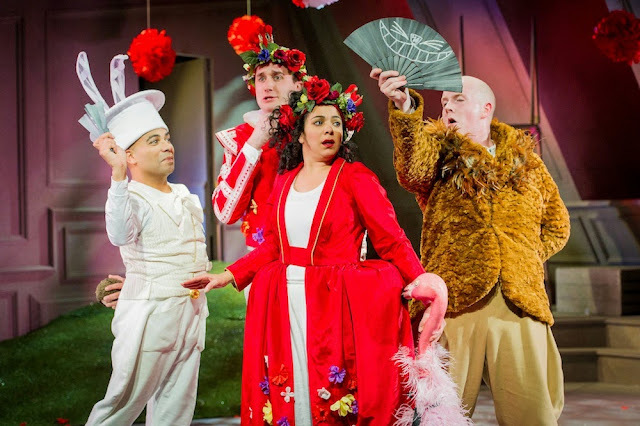 Alice in Wonderland is on at The Polka Theatre until 15th February 2014 and tickets are available here and by calling the theatre on 020 8543 4888. If you're looking for any other shows the kids will love then you should also check out our review of another Polka Theatre show Gorilla. Thanks to the Polka theatre for inviting us to see Alice in Wonderland. We received 4 tickets in exchange for this review. All opinions and views are our own. 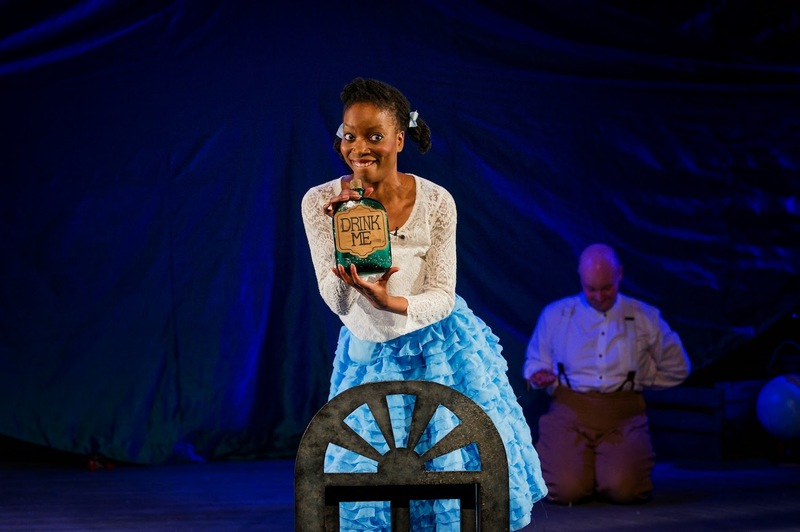 As an Alice who's obsessed with Alice, in Wonderland, I always worry with New adaptations of Alice, keeping the magic in of the original book is quite a challenge, especially on stage. I'm really pleased that you loved it as I'm now itching to go and see it myself that bit more. I love that they're all played by 6 people too that fascinates me.... Right, that's it, tickets to this are now on my Christmas list!!! HHHOOOOOFFFFFFFFFFFFFFF!!! That sounds like an amazing production and I love the sound of the theatre too. What a lovely review! This looks fantastic and I knew that Alice would have commented already! It looks like a fab adaptation.